● The device arrives with a bright 7.0" display with detailed maps. With free lifetime map updates, your routes are sure to reflect the most up-to- date maps, POIs (points of interest) and navigation information. 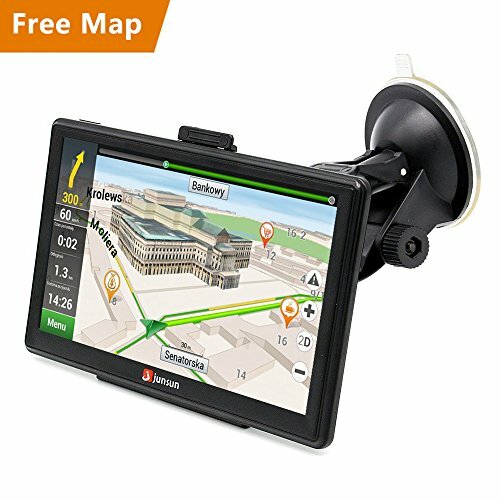 ● GPS Navigation has lane assist with junction view that displays upcoming junctions and uses brightly colored arrows to indicate your proper lane. and easily navigate complex interchanges. ● The device keeps your driving map onscreen at all times and additional information appears alongside. For details, simply ask or touch the screen. As you drive your route, Up Ahead constantly informs you of nearby services, including restaurants, fuel stations, hospitals and stores. ● All equipment pre-installed maps for North America map（United States, Canada， Mexico） If you need maps of other regions, please contact us and we can send you free of charge Europe / North America / South America / Southeast Asia / Middle East map. --Best Customer Service: 30-Day Money Back Guarantee; 12 Month Replacement Warranty; Any questions please contact us via email and we will reply within 24 hours. 【Multi-vehicle Support】 Car, Truck, Pedestrian, Bicycle, Ambulance, Bus, Tax, you can select according to your vehicle type. 【7 Inch TFT LCD Display】7 inch super large capacitive touch screen, clear for view, the touch screen reacting fast with no delay. 【3D Navigation】It shows you exactly which lane to take before you approach an exit, turn or difficult intersection-so you can stay on the right path. 【Lifetime Free Map Update】This GPS pre-installed US maps, including United States, Canada, Mexico. Please check the user manual to update the map or contact us via seller contact to get help. Manufacturer: Shenzhen Junsun E-Commerce Co., Ltd. Publisher: Shenzhen Junsun E-Commerce Co., Ltd. Studio: Shenzhen Junsun E-Commerce Co., Ltd. If you have any questions about this product by junsun, contact us by completing and submitting the form below. If you are looking for a specif part number, please include it with your message.